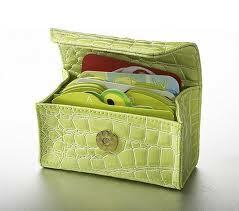 … a money saving, stylish, alphabetized mini-card file that fits in your purse, briefcase, or car console! Measuring 3” by 5” in multiple colors it holds up to 80 cards! File all those coffee punch cards, gift cards, and even coupons. Save money by having all those frequent buyer/discount cards organized and always on hand. The perfect gift for Mother’s Day!